Hardys Well is written upon a Pub of the same name on the corner of Dickenson and Wilmslow Rd in Manchester. It stands aside the busiest bus route in Europe. The once distracting poem caused so many fender benders that traffic calming structures were built at the adjacent junction. 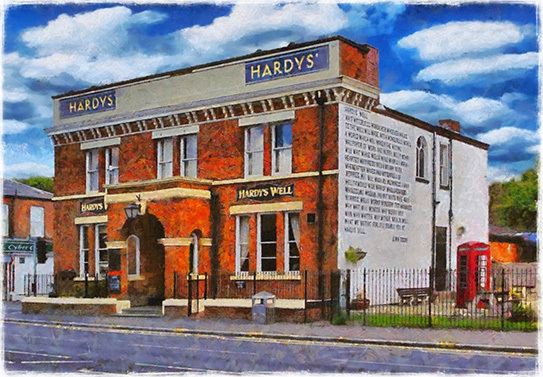 In 2015 The Rusholme & Fallowfield Civic Society submitted an application to Manchester City Council to have Hardy’s Well listed as an asset of community value. This is in an effort to ensure it continues as a place of social and cultural significance in Rusholme. It is nearly 200 years old.